Crude prices are $49.81 this morning, gaining $.22 (.44%) since closing yesterday. Prices saw sizable gains during yesterday’s trading session following the EIA inventory report, rising $.80 (1.6%). The market bearishness following the API report has given way to more optimism for producers (and pessimism for consumers) that inventories will continue to be drained. Refined products are both relatively flat this morning. 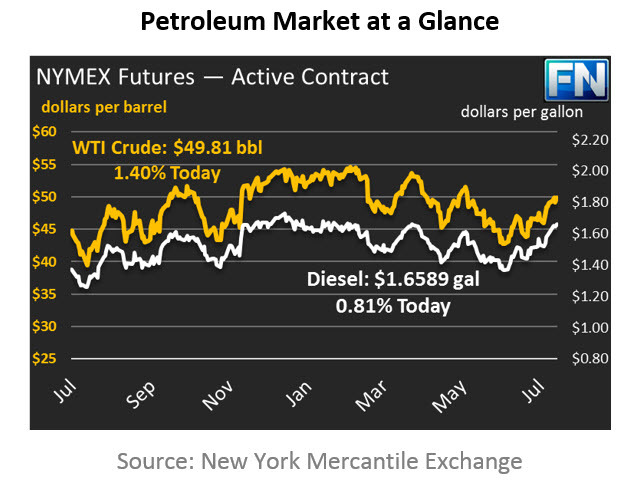 Diesel fuel is at $1.6589, just 1 point higher than yesterday’s closing prices. Yesterday, diesel rose 2.2 cents (1.3%), slightly lower than crude’s gains, given the smaller draw. Gasoline is $1.6456, 8 points above yesterday’s close. Gasoline actually shed 1.2 cents (.7%) yesterday as PADD 1 saw an unexpected build and traders exited their market position. Yesterday the EIA released their weekly oil inventory data. Markets fell on Tuesday following the API’s announcement of a surprise crude build, but rose following the EIA’s report of a 1.5 MMbbl stock draw. While this was not as much as markets were hoping for, it was a relief to traders from the anxiety brought by the API report. Gasoline fell 2.5 MMbbls and are now 11 MMbbls below 2016 levels, driven by strong seasonal demand. Diesel fell only slightly, shedding .15 MMbbls. Diesel demand is still strong, but production has been equally as strong, keeping inventories mostly flat. Overall, cumulative commercial crude and petroleum products (including products like jet fuel, propane, and others) rose slightly this week, helping to put a slight damper on crude markets. With prices once again pushing against $50/bbl, producers are looking for opportunities to lock in prices for 2018 to allow for profitable drilling. Bloomberg reported an increase in volume for June 2018 production as well as higher demand for put options. After prices fell from their 2017 highs around $53, producers became nervous that they would not have another opportunity to lock in profits next year; the recent resurgence of prices has given a new opportunity for producers to offset their risk.